Ah, social networks. Is there any better tool to maintain a friendship than Facebook or Snapchat? Well come on, with the WhatsApp groups you can keep up with all the stories of your environment. But what would happen if I told you that there is an app that has gone viral and promises to leave you without friends? His name is Lies and you'd better lie to keep them. Do you dare to try it? It does not have much mystery. 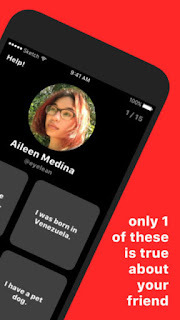 Download the app and register through other social networks to connect with your friends and fill in your file. Next, choose 15 questions from which the app offers a database of 2,500 and growing. You will have to answer the truth to complete your profile . In the purest style, " kiss, truth or daring ", but leaving the first and third options behind, you will answer questions as if you have ever stolen from a store. Imagine that you have never stolen a sad licorice and that your contacts create en masse that you are all a white glove thief. But what an image they have of you! Then your friends should select among the 4 possible options which one suits you the most. Come on, what is the correct answer, the true one. Will they know the truth? Whether they succeed or not, you can evaluate the results and discover if they really know you. 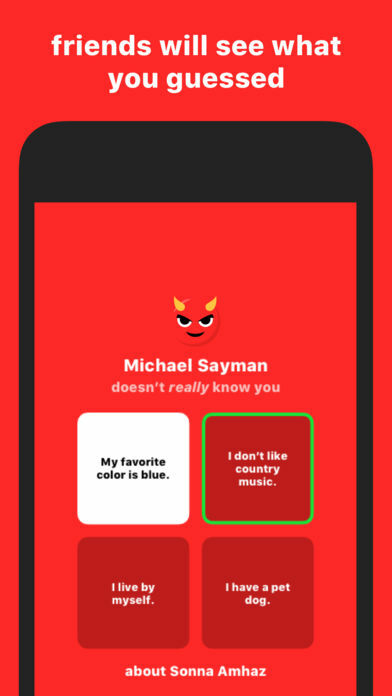 Michael Sayman, a boy of just over 20 years old, is its creator. Former Facebook worker, he knows very well the secrets of social networks and the key to success among groups of people . And is that if something has learned from his stage under the command of Zuckerberg is to experience new functions. At the moment, Lies is free but Sayman says he intends to monetize it. Do you still want to see what others think of you?